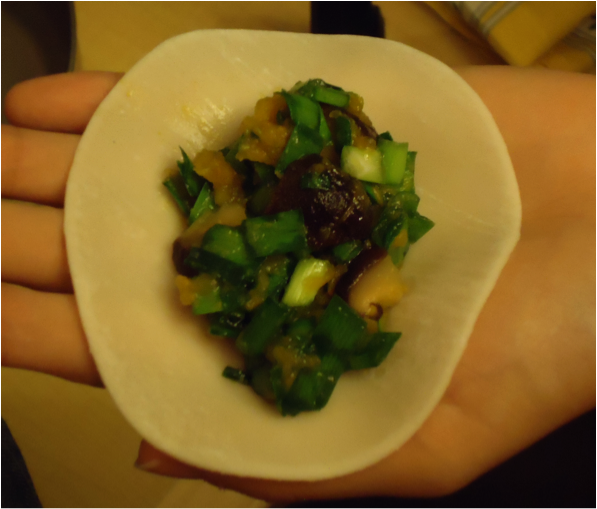 At the last KJ SC Test Kitchen, we revamped our typical sushi night and held an Asian inspired food celebration! 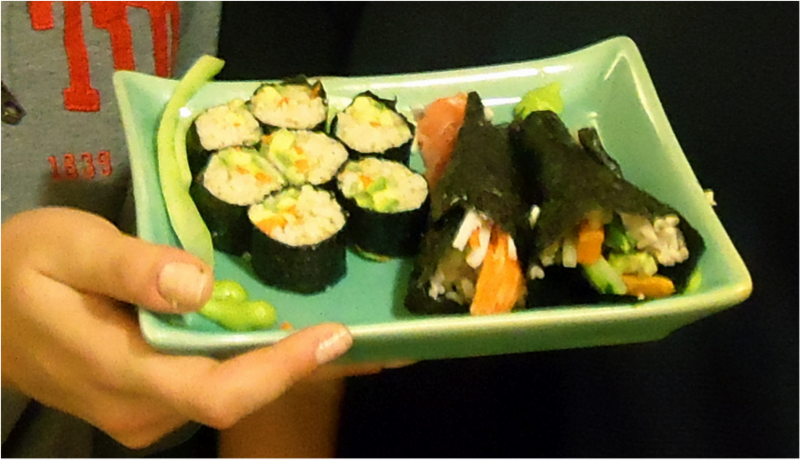 We made Karen’s famous California sushi rolls (with brown rice), miso soup and even dim sum. 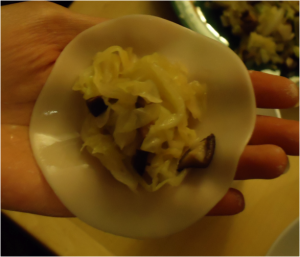 Note: Whole-grain dim sum wrappers were not available. Although the dim sum recipe does not get the complete Sargent Choice stamp of approval, the vegetables and refined grains still offer beneficial nutrients. The traditional, plant-based rural diets of Asia (are) linked to much lower rates of certain cancers, heart disease, obesity and other chronic diseases than those found in the United States. Traditional Asian diets are lower in salt and sugar than the typical Western diet. This is largely due to the Western diet containing more processed foods and desserts than Asian populations. Whole grains and rice are major staples in traditional Asian cuisine and are generally eaten daily in controlled portions. One of the biggest differences between the Asian diet pyramid and the Western diet is the consumption of meat protein. American dishes tend to place meat at the focal point of a plate, where many Asian dishes feature grains and vegetables as the star of the meal, with small portions of lean meat protein acting to highlight the vegetables and grains or to add a touch of flavor to the dish. One of the most important attributes of the Asian diet pyramid is physical activity. Asian populations are generally more active in their daily lives than Americans. For example, most of the population walk or ride a bike to work or school. This high level of physical activity is also believed to contribute to the low incidence of chronic diseases seen in Asian populations. In fact, physical activity is the base of the Oldways Asian diet pyramid. To make your own Asian-inspired dishes, see SC’s Dim Sum recipe here and our SC Vegetarian Brown Rice Sushi recipe below. 3. Transfer rice to a wide, nonmetal bowl and sprinkle with vinegar mixture. Toss gently with a large spoon to combine. Cool rice, tossing occasionally, for about 15 minutes. 4. Stir together wasabi and teaspoon of water to form a stiff paste. Let stand for at least 15 minutes to allow flavors to develop. 5. Arrange 1 sheet of nori shiny-side down on a sushi mat lengthwise. With damp fingers, gently press half the rice onto the nori with a 1 ¾-inch border on the farthest edge. 6. Starting 1-inch from the side nearest you, arrange half the cucumber matchsticks, carrot matchsticks, avocado slices, and tofu pieces in an even strip horizontally across the rice (You may need to cut pieces to fit). Repeat with half the radish sprouts, letting some sprout tops to extend beyond the edge. 7. Roll the bottom edge of mat toward the top edge while holding the filling in place and pressing firmly to seal roll. Let stand for 5 minutes with the seam down and cut crosswise into 6 pieces with a wet knife. 8. Repeat steps 5-7 with the second sheet of nori.